Jumanji 3 is currently in the rehearsal phase and Dwayne Johnson has shared a behind-the-scenes sneak peek. The phot features Johnson, newcomer to the franchise Danny DeVito, and previous Welcome to the Jungle star Kevin Hart. Fans were taken aback to learn that DeVito had joined the cast, along with Danny Glover and Awkwafina. However, since this is Johnson that we're talking about, he couldn't just post the picture on its own without taking a dig at Hart. Obviously, Dwayne Johnson and Kevin Hart are good friends, but the former pro wrestler can't get enough of poking fun at the comedian on social media. Jumanji 3 is about to start filming to make sure that it keeps its December release date intact, but it appears that there isn't too much pressure going on behind-the-scenes at this time. Johnson had this to say about the sequel and Hart. "Dear audience, Oh the fun you are going to have this CHRISTMAS when you watch our new Jumanji. Love you all, DJ aka Dwanta Claus. Danny DeVito aka Everyone's favorite grandpa. Hart aka My chocolate biscuit sh*t son." This isn't the first time that Dwayne Johnson has referred to Kevin Hart as his "chocolate biscuit sh*t son." At the end of last year, Johnson posted a screenshot of a Kevin Hart live feed with one of his own comments that stated that he wanted to "punch a hole" in his "stupid face." The comment, along with the new nickname received a lot of traction on social media, and Johnson seems happy to bring it back. As for the rest of the Jumanji 3 cast, Jack Black, Karen Gillan, and Nick Jonas are all coming back with Dwayne Johnson and Kevin Hart to reprise their roles. Additionally, the young cast, including Ser'Darius Blain, Alex Wolff, Madison Iseman, Morgan Turner, are all coming back too. As for the roles of Danny DeVito, Danny Glover, and Awkwafina, those are a mystery at this time, though we should get some information about them in the coming weeks when production officially kicks off. Johnson just wrapped production on the Fast and Furious spin-off Hobbs & Shaw and is jumping right into Jumanji 3. Jumanji 3 is all set to hit theaters on December 13th, which is a solid release date, but also a week from Star Wars 9 debuting. Welcome to the Jungle opened up right before The Last Jedi and had no problem going on to earn nearly $1 billion at the global box office. 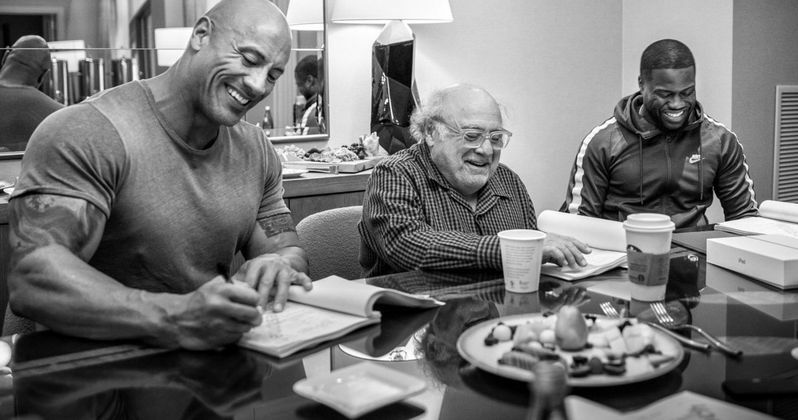 With the addition of Danny DeVito and the other new castings, along with the returning cast members, Jumanji 3 should have no problem making a killing at the box office when all is said and done. You can check out some nicknames for Kevin Hart below, courtesy of Dwayne Johnson's Twitter account. Oh the fun you are going to have this CHRISTMAS when you watch our new JUMANJI. DeVito aka Everyone’s favorite grandpa. Ever hate someone so much you wish you could kill them with your eyes.